Le Toit (12 & 13). Each house consists of two floors, with a common room on every odd floor. Each common room includes a microwave, television, and comfortable furniture. Every even floor has a Don. Dons are upper year students, who are here to support you and act as a resource person during your time in residence. The Residence Life Coordinator (RLC) is responsible for supervising the Dons, and for overseeing all aspects of Residence Life. They are also available as an additional resource for residents throughout the entire building. Vanier Residence is set up to afford students more opportunities than merely the convenience of living on campus. Your Residence Don, in collaboration with the Don of Leadership and Learning Opportunities (DLLO), develop numerous events and programs. Each evening, Night Porters are responsible for signing in all residence guests. Residence Council Volunteer positions will be available beginning September, giving students leadership opportunities and enhanced involvement in Vanier Residence. 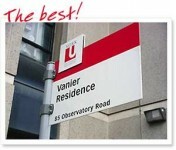 Check out the Vanier Residence 2018-19 Facebook Group as well if you have already accepted a room offer in Vanier! Living in residence is a unique opportunity to get involved in the College and campus community through part-time jobs, and leadership opportunities, as well as a chance to get to know others with similar interests. To make the most of your Residence experience, we hope you’ll take advantage of all we have to offer. If you have additional questions, please feel free to contact the Residence Life Coordinator, for more information. We look forward to meeting you!